It is very difficult for the new learners to select a superior guitar for themselves. Don't worry. 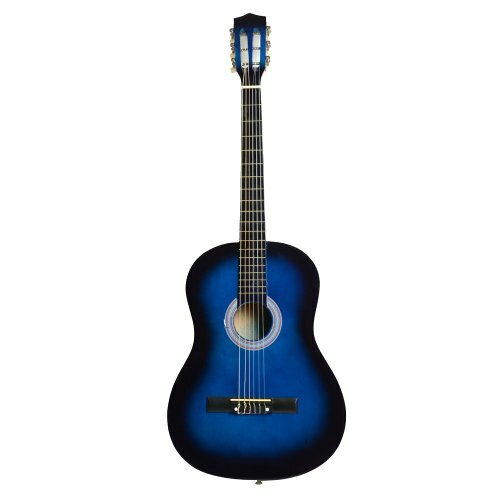 Here is our wonderful 38" Professional Acoustic Classic Guitar + Pick + Strings we highly recommend to you. With humanized design and high quality, it is attractive and durable. What is more, the standard tone from this guitar gives you wonderful audio experience. It is so lightweight that it can be taken everywhere. In addition, first-rate pick prevents your hands from getting hurt. And the guitar strings have good elasticity and bright tone. All of them are reliable and durable. Wise choice! 1. Package Dimensions: 40.55 x 15.94 x 3.94"
2. Dimensions: 37.79 x 13.78 x 3.27"